Through the production of an annual world-class horse show, The Pin Oak Charity Horse Show supports the healing of sick children through financial donations, outreach, and volunteer support for Texas Children’s Hospital. The Pin Oak Charity Horse Show is a multi-breed show – a rare treasure in North America today. The Pin Oak Charity Horse Show is known for its rich history, time-honored traditions, equestrian excellence, and extraordinary giving. 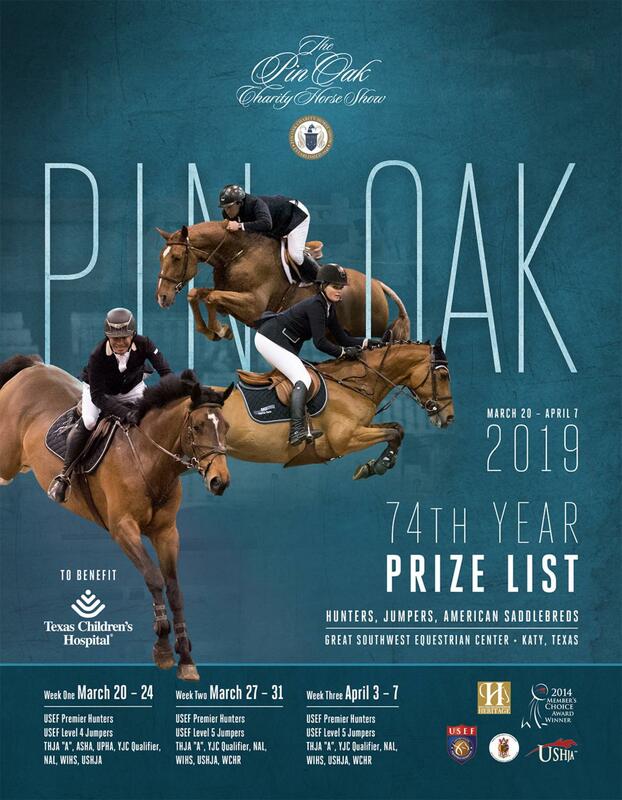 As one of the oldest and most prestigious horse shows in the country, Pin Oak is also one of Houston’s unique social and fundraising events. In 1945, JS Abercrombie had the vision to create a world-class horse show to benefit the community. His vision became a reality on May 26, 1945, with the sound of the trumpet heralding the opening of the Pin Oak Charity Horse Show. Known for its legacy of charitable giving to support the healing of sick children, Pin Oak holds the honor of being the first donor to Texas Children’s Hospital in 1947, by providing the seed money to begin the planning and building of the world’s first pediatric hospital. Today, Texas Children’s has grown to be the largest pediatric medical institution in the world and has millions of patient encounters annually. With over $6.5 million dollars in giving to date, Pin Oak has also supported the Ronald McDonald Family Rooms (located at Texas Children’s) and Candlelighters Houston for their work in the Texas Children’s Cancer Center. In 2018, the horse show continued to grow by added a third week to the schedule! The show expands over the last two weeks of March and first week of April, with a dazzling array of horse and rider teams competing in a multi-breed equestrian extravaganza. Taking the stage are American Saddlebreds (Week I only), the classic Hunters, Olympic-level Show Jumpers, and Working Equitation. Only a handful of horse shows continues to host a variety of breeds and disciplines as a major equestrian event. 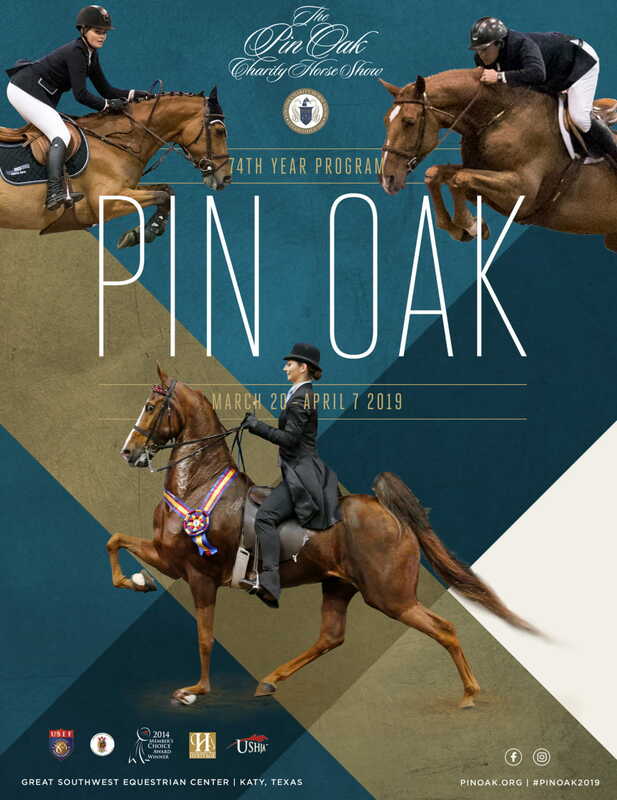 As such, Pin Oak was honored to be the first show in the United States to be designated as a Heritage Competition by the United States Equestrian Federation. The North American Riders Group (NARG) selected Pin Oak as a Top 25 horse show in North America three years in a row. Many other awards and “Best Show” designations have been collected over Pin Oak’s history – creating our tradition of excellence for this equestrian athletic event. Join the legacy of giving today! A passion for helping build a better community by helping others was the driving force for J.S. Abercrombie in creating the Pin Oak Charity Horse Show. As a team, J.S. Abercrombie and Leopold Meyer worked tirelessly to create a horse show that exudes elegance and excellence to raise charitable funds to build a hospital specifically for children. The show debuted in Houston on May 26, 1945, as J.S. Abercrombie’s Pin Oak Stables with proceeds given to charity. It was a premiere horse show in the country and quickly became the social event of the season in Houston. The annual horse show began at the original stables in Bellaire amind much fanfare. Quickly, tickets for Pin Oak were harder to come by than Kentucky Derby tickets. Through sponsorships, box, and tickets sales charitable funds were raised to make a difference in the community. In 1947, the first donation was made from the show’s proceeds as the seed money to begin the planning of the first pediatric children’s hospital. This seed began the long-term commitment to raise funds to construct and support Texas Children’s Hospital which opened its doors on February 1, 1954. During the next three decades, “Mr. Jim” Abercrombie, Leopold Meyer, the Junior League and a group of dedicated Houstonians established Pin Oak as one of the preeminent horse shows in the nation, attracting as many as 60,000 visitors, and enabling the Association to contribute millions to worthy causes. In its history, the show has been met with challenges. Over time, the famed Pin Oak stables were no longer part of the Houston landscape, and the Pin Oak Charity Horse Show struggled to find a permanent home. It moved from the Astrodome to the racetrack and finally to its current home at the Great Southwest Equestrian Center in Katy, TX. As Pin Oak continues this legacy, our giving continues to grow as Texas Children’s Hospital grows. Pin Oak has given funds for the Casting Room at the West Campus, Sports Medicine program at the Woodlands campus and in 2018 made a new commitment to the Legacy Tower for the 12th floor Family Patient Play Room. Past donations were also made for needed research at Texas Children’s and supporting the construction and maintenance of Family Room Centers at the Hospital staffed by Houston’s Ronald McDonald House Family Rooms volunteers. The Family Room Center continues to grow and serve the families of seriously ill children and the children themselves by providing a home away from home. Candlelighters of Houston, which benefits the needs of families facing childhood cancer, is also a former beneficiary of Pin Oak. 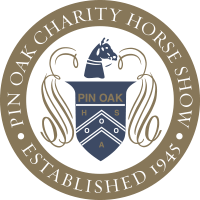 Continuing in its social tradition and honoring its rich heritage, the Pin Oak Charity Horse Show continues to garner accolades, awards and enjoys an enviable stature in the horse show world. In 2009, Pin Oak was designated as the first Heritage Competition in the country by the United State Equestrian Federation that is a source of pride for the show. Continuing to grow in prestige, Pin Oak was named by NARG (North American Riders Group) as Top 25 horse show in North America many times over. The recognition does not stop there; Pin Oak has been voted favorite breed show multiple years and a UPHA Chapter Honor Show – Pin Oak continues to strive for excellence in keeping with its traditions.